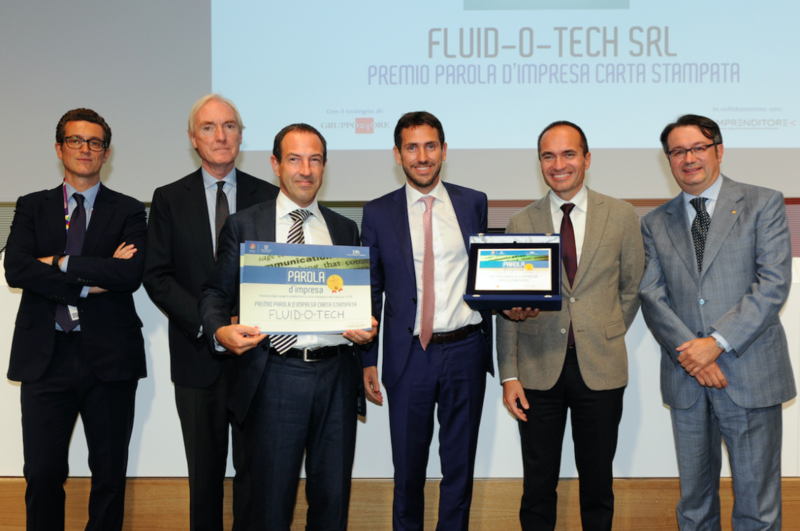 With the brand-new advertising campaign “LET OUR ITALIAN HEART BEAT IN YOUR MACHINE”, Fluid-o- Tech won the first prize for newspaper advertisement PAROLA D’IMPRESA. The award is organized by Piccola Industria Confindustria and UPA (Associated Advertising Users) with the support of Il Sole 24 Ore to reward the best advertising project for SMEs. The campaign is the story of a machine that needs a heart to work and live, though also a heart that only Italian-made manufacturing can put in what it does: passion, creativity, care for detail, design and quality. These are all ingredients for which our products and our way of working have always stood out. We are happy we managed to transmit our passion and the importance of our values and identity also to the world outside. ceremony in the Auditorium of Palazzo Italia at Expo, held on 20 October 2015.